On a gig, us drummers have enough to worry about, what with keeping the band on course, preventing the guitarists from drinking their body weight in beer before the encore and making sure we nail that fill in the third song. So, we need to turn up prepared. 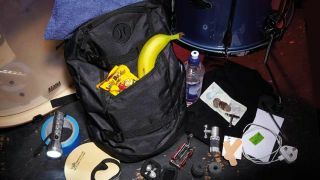 Taking it as read that you will arrive with a wad of sticks of different sizes and styles (just in case your rock band turns up to find you're booked into a tiny club with a limiter), there are 17 key items you need to make sure you have in your gig bag if you want to avoid injury, embarrassment, withering looks from your frontman and all-round disaster on the night. A towel is vital for wiping the sweat from your brow and hands between songs. Additionally, bringing a towel to a gig is also a sign of courtesy as you can wipe the throne down, post-performance, during kit shares. We've all done it - a cymbal topper flies off and, thanks to the absolute lack of any light on stage, simply cannot be found. Whip out your trusty torch and it'll be located in seconds. Good old gaffa tape, the drummer's best friend. Handy for all sorts of things, including dampening heads/cymbals, and strapping cables to the ground. Head out on stage cold to your peril. Whip your trusty pad out and run through a few exercises before show time and you'll be far more relaxed, thereforecutting the chance of injuries. From those heart-warming gigs when you're given your own stage pass, why not look ultra professional by popping it (and a drum key) on a lanyard? Did that energy drink not quite hit the spot? A sugar-heavy snack can give you a quick energy boost to see you through the set. We cannot overstate the importance of this one! Avoid tinnitus by packing a pair of ear plugs for every show. A Swiss army knife for drummers, a handy tool like this can ease nightmares like your bass pedal collapsing halfway into your first song. Hi-hat clutches and cymbal felts, surely the most elusive items on the planet. They've disappeared more times than David Copperfield, so pack some spares. The meaty shot intended for your snare instead connects with your finger and here comes the claret. Plaster it up to keep the dirt out and keep that brand new snare head the colour it was meant to be. This may be a bugbear for some drummers, but when you're in a tight spot with a particularly unhelpful sound man, a spot of Moon Gel could be just what you need to sort your snare sound. Once you've used your maps app to find the venue, done your last-minute promoting on Facebook and shared pre-gig pics on Instagram you'll be out of juice and unable to film those mid-gig iPhone videos. And that just will not do. Squinting at your phone or peering through your cymbals at the guitarist's setlist is far from ideal, so make sure you pack a pen and paper so you can scrawl your own list or last minute charts. Any drummer worth their salt won't just have one of these for gigs, they'll have one (or more!) about their person at all times. And one in the stick bag. And one in the glove box. Not all pubs have made it to the 21st Century, y'know, so keep some readies in your pocket for those times when your debit card is as useful as a chocolate teapot. The sweat-drenched post-gig T-shirt is not a good look. Pack a spare and you can keep fresh as a daisy and stay warm as your sweat turns to ice during the load out. It might be cooler to say you down a shed-full of pints every gig, but a bottle of water is key for staying hydrated during a performance, and the sugar boost from an energy or isotonic drink might just be a gig-saver.